In today’s post I again want to look at safety but in the broader context of general hazards while hiking that you may encounter as you venture out into the wilderness. Safety is pretty much the primary priority when you head out on the trail. Whether you’re new to hiking or a seasoned trekker, I think there is always more room to learn about safety. That has certainly been my experience anyway. Every time I go to a new country to hike there I need to be mindful of the unfamiliar environment I am going into and what hazards that may present. However, even in areas that I hike in regularly, there’s always more to learn about in terms of safety as the land, the weather, the routes, the people, etc. are always changing. Broadly speaking, there are four main categories of hazard that, as a hiker, you should be aware of and keep yourself informed about. well … let’s have a closer look at each of these categories in a little more detail to find out. Topography is the arrangement of the natural and physical features of a place or area of land. So when we think of topography, we are thinking of the well known phrase, which I’m sure you’ve used on occasion, ‘the lay of the land’. This list is not exhaustive and each hazard listed deserve’s it’s own special attention. For example, when looking at rivers, sometimes people can make the mistake of thinking a waist deep river isn’t that big of a hazard. If you fall in, you just swim to safety or climb back out. However, rivers like that are a great example of how hazards can be very deceptive. When looking at a river, unless you’re well versed in judging that type of thing, it can be very difficult to judge the current. While it may only be waste deep when standing, if the current is strong enough, it will quickly knock you over, submerging you and dragging you further downstream to deeper areas. All of this most likely along a rocky riverbed. In fact, any river above ankle height has the potential to sweep you off your feet relatively easily, given the right conditions e.g. speed of current, etc. Topple over in a river with a heavy backpack on, you could get into serious difficulty very quickly. As a general rule I recommend trying to avoid crossing rivers, why take the risk if I can hike a bit further to avoid a water crossing or find a bridge. Note: rivers can present many other dangers, this is just one that I’m highlighting for illustrative purposes. When considering this category of hiking hazards you need to think about any hazards the climate and weather or the environment you’re hiking in could present. For example, if you’re hiking in freezing conditions in snow, hypothermia is a real hazard you need to be aware of. On the other side of the coin, the same applies if you’re hiking in really hot conditions like deserts where hyperthermia can potentially become an issue. If you hike on open mountains in area’s prone to bad storms and lightening, you need to recognize that as a hazard as well and ensure you have the knowledge, tools and ability to take the appropriate evasive and protective action to stay safe. A good illustration of this was a story I heard once about a small group of hikers who were hiking in mountains, not 100% sure where this happened but I have the Rockies in my head, and a bad storm with thunder, lightning and the works kicked in. Their immediate reaction was to find shelter. There was a cave on a rocky outcrop close by and they all went to there for shelter thinking they would be safe. It turned out to be a very bad move. The stone can channel electricity well and so they effectively walked into a death trap and unfortunately it did not end well. When looking at human hazards we are talking about things to do with the actual hiker themselves. These are things like fitness, health, etc. In a lot of ways, this category should be the most preventable. Proper preparation and good sense are the watch words here. For example, I know of a Guy who took a group of people on a trek in Winter. He checked in advance if anyone had health issues and everyone said no. They went on up the mountain, in snowy conditions, and one woman on the hike started to have an asthma attack! To make the situation even worse, she didn’t even have her inhaler with her! It all ended well thankfully and she was escorted back down the mountain. It completely nuked the hike for everyone else though as everyone had to come down. It is a good example of where a hazard was totally avoidable if good preparation and good sense had been adhered to. Why the lady chose to keep her health information from my friend, even after being asked about it, we will never know but it just goes to show that people can do stupid things and / or take needless risks! Another key one here is having the right hiking gear and equipment. If you go out hiking in heavy rain without a waterproof hiking jacket or adequate hiking boots, you will suffer the consequences. Again, preparation, preparation, preparation! This category of hazards relates to the actual environment you’re hiking in. Some time back I did a post on Leave No Trace and that is a key element of this grouping. Take out everything you bring in, always be respectful to the environment you’re hiking in and leave it like you’d never been there! Another thing to consider here, in terms of access, is where you’re hiking. If you’re hiking in national parks, that’s totally cool as that’s what they’re there for. There are trails and clear rules to follow should you wish to go into the wilderness, so there should generally be minimal issues in terms of access. However, sometimes, private lands can be close to public parks. In many of these cases, as it’s private you’re probably not allowed to go hiking in it without permission. While I am all for hikers having as many rights as possible to hike where they wish, I also appreciate that private land is private land. Boundaries should be respected and permission sought in advance to hike across someones lands. Many times, all you need to do is be courteous and respectful enough to ask. There may also be regional / national governmental bodies who can advise on the rules depending on what country you’re in. So there we have it. These are the main categories of hiking hazards that you should be aware of when you head out on the trail. However, it is not an exhaustive list and the categories can vary considerably depending on where you’re hiking. For example, weather hazards while hiking in the outback in Australia will be considerably different from hiking in the Himalayas. As always, preparation is the key. Educate yourself and take the time to research and prepare for your hike in advance, especially if it’s in a country or environment you’re new to. You’ll find a wealth of information on the net or you can check out forums to speak to someone who’s hiked there before (sometimes this is also the best option for tips, tricks, route suggestions, etc. on a particular hike). As always, safety is paramount and preparation now, prevents pain later and helps ensure that you’ll have as enjoyable a hike as possible! Have you ever experienced difficulty with any of these hiking hazards on the trail? I’d love to hear your story in the comments below! Hiking At Night – A Great Way To Enjoy The Mountains! About three years back, I did something completely new for me in terms of hiking, I went hiking at night. Although I have been hiking most of my life, for some reason, it had never really occurred to me to go out on the mountains when the sun went down. Sure, I’d been camping plenty of times before so I was out in the mountains as such, but I never really went hiking. I found my spot for night, pitched camp and that was it till the sun came up. Now, I am not really sure why it never occurred to me to not just head out for a hike, even while camping. I just never really bothered with it. So when someone suggested a night hike a few years back, I was excited to try it out. Just to be clear, what is Hiking at Night? Well, it’s pretty much exactly what it says, a hike at night. Yes, this sounds a bit simplistic but I am referring to hiking in mountains at night, so no big light as such except for natural light that might be coming from the stars and the moon in the night sky. That first time I went out, I have to say that it was pretty cool. We hiked into some mountains close to Dublin city and it was a lot of fun. The Guys I went with were regular night hikers so they had a good route that was suitable for night hiking. One I knew well by day but not by night. It was an easy route, we stuck to well marked paths and trails for most of that hike so it wasn’t like we needed to do tough night navigation deep into the mountains or anything like that, not on my first time out anyway. However, in saying that we did need to keep our eye’s on the ground a lot, as there were places where there were a lot of loose rocks and some dangerous holes in the path along the way. We crossed a river at one point on that first night out, one I have crossed many, many times. However, seeing the reflections of the light of the moon bouncing off the water was really pretty and special. It’s a great spot during the day but in the quiet of the mountains at night, it added a whole new dimension to it. We also got some sweet views of the city lights from the mountain that night. As I mentioned, I’ve done this hike before many times in all sorts of weather, from pelting rain to sunny blue skies. I thought I’d seen it all but no, this was a new and unique experience on those same trails I’ve hiked many times before. Really beautiful. What was really interesting about it all too was that, at the lower parts of the mountain, normal folks were out with head torches just walking their dogs or running. Now I would never really have thought of this for general recreational purposes. Since that time, I’ve hiked at night, many, many times. I have of course also ventured much deeper into the mountains at night sine then as well, but I was sure to learn how to navigate at night first. You definitely need to take your time getting comfortable finding your way around easier parts of the mountains in the dark before going further and deeper into them at night. So, what more can I say about hiking at night? Well, of course, it is night time so you can’t see a whole pile, at least not in the way you normally would. However, there is a beautiful ambiance at times when you find yourself in places where there is enough natural light, from the moon etc., to be able to hike without our headlamps (more about those below). It was very serene and oddly calming. Pleasantly haunting in a nice way, if there can be such a thing. Hiking at night, can definitely add a really beautiful dimension to hiking. Everyone has seen a clear night sky where the stars are shining and the moon is up, it’s a beautiful thing to gaze upon. If you’re on a mountain away from the hustle and bustle of the city, you of course have no street lights, car lights, etc. What does that mean? Well, on a clear night, you’ll get to see the night sky in a truly beautiful way minus the normal light pollution that usually blocks the view. It is generally a lot lower in the mountains and at the right time of the month, in the right place and if the weather is favorable, you can get some awesome views of the night sky and yes, even the land. The dark rolling hills in the mountains can have a unique beauty under a clear night sky dappled with spots of light from the stars and the moon. Throw in a couple of clouds and the shadows moving across them can be fantastic to stop for a bit and watch. If you’re a keen photographer, you can get a lot of great shots too … if you know how to take night shots that is 🙂 Something I have most definitely have no idea how to do. How Can you Stay Safe Hiking at Night? As always, when you hit the trail, your safety is the number 1 priority. The same things that apply in a day hike, apply at night too. Tell people were you’re going, bring the right gear with you, water and snacks, leave a map of your route with someone who’ll notice if you don’t return, etc. Hiking in a group or with a few people is sensible. As in the daytime, if someone gets into difficulty you have more people to help out. On your own at night and you take a tumble and go unconscious, you’re going to be much harder for any passer by to spot. If you’re with a few friends, they’ll of course act immediately. If you can, head out with some folks who were well used to hiking at night, like I did on my first time out. That bit of extra experience is always going to help keep you that bit safer. You need a good source artificial light. While there can often times be great light from the moon and the stars, it is still night time of course. Only on a rare occasion will that kind of light be enough to see you safely round the mountains on a hike. A lot of the time, light from the moon and stars is entirely absent if enough clouds come in or at certain times of the lunar cycle. So with that in mind, if you fancy giving night hiking a go, one of the key things you will need in terms of gear is some artificial light, a headlamp to be precise. I figured I’d go into this part, in a bit more detail as it is important. A headlamp is effectively a lamp that wraps around your head and rests on your forehead. A good headlamp will usually have different power settings so you can make it brighter or more targeted as required. A headlamp is an absolute must for night hiking and useful to keep in your pack at all times just in case. You never know when you might get stuck on a mountain and not get off it in daylight. For example, if you get injured and your ability to move is significantly decreased, night time may fall before you can get off and if you have no headlamp with you, you’re more or less wandering in the dark. Similarly, simply getting your timing wrong or taking a wrong turn on your route could add an extra few hours to your hike. That delay could result in your being stuck out on the mountain into the night and again, with no light to guide your way, it’s not going to be easy to get off safely. There’s a fair bit to think about when getting a good headlamp. There are a lot of not so great ones available, and some very good ones. Same as anything of course 🙂 I’m currently writing a more detailed buying guide which I will link to from here when it’s published. At the minute, I use the Black Diamond Storm Headlamp. It works very well and I am a big fan of it. I won’t relist the settings here, click on the link or the picture above to read a detailed review on it’s capabilities. Suffice it to say, I am very pleased with it’s performance with the only downside possibly being that it can be a bit heavy on juice. Not the end of the world though. Overall, hiking at night is something I highly recommend trying out. It’s a lot of fun and definitely adds a different dimension to things. I still fondly remember that first night hike, it was a great success and I had a blast. It was really cool to see the lights of the city by night, very pretty. The nicest thing though, was that in places, as mentioned above, you could just switch off the headlamp and walk in the dark as there was enough light coming from the sky from the moon and the stars. Really beautiful and one of the coolest things to experience while out night hiking. Remember, as with any time you’re going out hiking, safety comes first. Therefore, if you’re planning to go out hiking at night be sure you have the appropriate gear, especially a good headlamp! As mentioned above, the same safety things you should check off for a day hike, you need to do at night as well. I also recommend going out in numbers, especially if you’re going into deeper mountainous areas. Do you like to go hiking at night? I’d love to hear about it in the comments below. The signs of frostbite can be subtle so it is a good idea to educate yourself well in advance before you are ever unfortunate enough to encounter them. Last week we looked at the danger that hypothermia can prevent to hikers while out hiking on the trail and some of the key signs and symptoms of it. In a similar manner, in today’s post we’ll examine frost bite. We’ll look at what frost bite is, signs and symptoms of it, some basic treatment tips and, most importantly, prevention. Frostbite is something I have first-hand experience of. When I was nine years old I entered the early stages of frost bite wearing the wrong footwear in snow. It was caught in time and remained in the first degree level. There was no permanent damage thankfully but I remember it all too well. It can sneak up on you and it is a miserable experience! Similar to hypothermia, frostbite is another problem that can be brought on by cold weather. Hikers want to avoid it at all costs and as we move further into the colder winter months, it becomes more and more of a potential issue. Frost bite sets in when parts of the body are exposed to extreme cold for long periods of time. When this occurs the body starts to move blood away from the extremities to protect the critical organs. This process coupled with lasting exposure results in damage to the skin and local tissues in the affected area due to freezing. Generally speaking, frost bite will start to appear in the extremities, like hands and feet, of the body first as there will be less blood circulation in those areas. Similar to sun burn, frost bite is rated in levels of degree’s running from one to three. Each higher degree is of course more serious than the previous one and will therefore cause more pain and damage which can potentially be permanent. This is only the beginning stages of frost bite and does not normally lead to any lasting damage if kept at this level. It affects the surface of the skin which becomes blotchy with the development of white, red or yellow patches which can also become numb and throbbing. Long term sensory damage can occur in the first degree e.g. loss of sensitivity to hot and cold in the skin. The problem starts to get more serious as ongoing exposure from the first degree leads to the hardening and freezing of the skin. This will result in blisters which can become hard and turn black. The numb and throbbing feeling of the skin will start to be replaced by a tingly sensation but as it progresses further, sensation gradually starts to fade. The impact while more serious, is still confined to the outer layers of the skin. Frost bite of this degree should still heal although the aforementioned insensitivity to heat and cold is more likely to be permanent in the affected area. Moving into third degree frostbite, the frostbitten area is impacted deeply resulting in deep tissue (muscles, tendons, etc.) freezing. The skin turns white or blue and is hard, blotchy and waxen. Deep frostbite is setting in at this stage and immediate medical attention is required. Again purple and or black blisters will develop. Extreme frostbite can result in gangrene and the loss of body parts e.g. toes, fingers, etc. Where possible remove any wet clothing from the individual. Try and keep them warm using blankets, coats, etc. If possible, try and submerge the affected area in warm water (101-104 degrees) until the skin regains a pinkish hue and color. For any areas that cannot be submerged, washing them repeatedly in the warm water may help. Try not to rub the affected area. Dry it gently as required and wrap gently in clean gauze bandages. Where blisters have formed, do not rub or open them. Where third degree of severe frostbite has set in, seek medical attention immediately! Keep an eye on your exposed skin for any signs of frost bite. As numbness is a significant factor, it can sneak up without you even realizing! In conclusion this post is not supposed to be a full treatise on the many dangers of frost bite while out hiking on the trail in winter, but rather an introduction to increase awareness. For most average day hikers, this should never really become an issue but if you get into difficulty, you just never know. If you’re stuck in bad snow and ice and can’t walk out, it won’t take long before the cold sets in. With that in ind, it’s worthwhile to educate yourself a bit further on this topic to ensure that if you’re unfortunate enough to get into difficulty, you have some idea of what you need to do to minimize any permanent damage until you can get out of the situation as quickly and as safely as possible. Remember, if you or someone in your party get’s into difficulty and you’re not sure what to do, call for help and ask for advice! Have you any special tips to help avoid frostbite? Tell us in the comments below. The signs and symptoms of hypothermia are many and it’s good to know what to look for in case of a developing emergency while out on your hiking adventures in the Winter time. With the depths of the winter months just around the corner, everyone should be aware of some of the unique hazards and dangers the season can bring while out hiking on the trail. In the context of this post, when hiking there are two common related conditions which are are good to educate yourself on, and protect yourself from. The first, which is not the subject of this post, is hyperthermia. In short this is where the body overheats. Today we’ll be looking at hyperthermia’s well known cousin, hypothermia. In short summary, a persons body core temperature is normally maintained at a practically constant level at 98 – 100 ˚F (36.5 – 37.5 ˚C). Hypothermia kicks in when a person’s core temperature drops below 95.0 ˚F (35.0 ˚C). This happens where a person is exposed to extreme cold for an extended period of time. Broadly speaking there are three stages of severity of hypothermia. An initial stage where moderate symptoms start to appear, a middle stage where symptoms become more pronounced and finally a severe stage which can be life threatening. If someone is entering the early stages of hypothermia they will start to shiver and shake. By shivering and shaking the body is reacting to the cold in an effort to keep itself warm. Other nasty things, like raised hypertension, also start to happen which can increase the risk of strokes, heart attacks, and so on. At this stage though, any shaking should be mild and can even go unnoticed. If not relieved in some manner, the body moves into a more serious stage of hypothermia. At this point the person will start shaking in a more violent and obvious manner. Mild confusion will start to become apparent in the person. Sign’s to watch out for, and a good and easy catchphrase to remember, are the mumbles, fumbles, stumbles and grumbles. They might start mumbling while trying to communicate. Their coordination will start to suffer. Simple tasks that require basic co-ordination will be hard to complete. They may start to stumble a bit and lumber as they walk. They may start grumbling and complaining. The key thing about the mumbles, fumbles, stumbles and grumbles is that the person themselves may well be oblivious to them and they may still even seem outwardly alert to an observer. Physically, the body rushes to protect the vital organs and signs of this are clear in a paling of the face and outer exposed points becoming blue e.g. lips, ears, etc. Note: the mumbles, fumbles, stumbles and grumbles are not only relevant to Hypothermia, they are signs to watch out for, for many conditions and are a general indication that something is up! When it moves to the next and final stage, where symptoms become severe, all the person’s physiological processes like respiration, heart rate, etc. start to falter. Shivering may cease and outer parts of the body, like hands, become useless. Skin will be clearly blue and puffed up. Stumbling, confusion and even irrationality will be clearly apparent. Eventually, major organs will fail. Avoid cotton clothes and wear synthetic and woolen fabrics as they are way better at insulation when dry or wet. You need to employ layers in winter and having appropriate hiking boots is critical. Check out the Complete Day Hiking Checklist in Pictures for a run through of all the gear you need to have for a successful and safe day hike. Also, and I can’t stress this enough, use your common sense and try and stay away from danger areas. For example crossing over stepping stones over a deep ice cold river or even walking over frozen rivers. If it’s not necessary, then best avoided! Also, if you head out on your hike and as you ascend into higher ground, you start to encounter very deep snow and it’s starting to get difficult to hike through it, it can be wiser to just call it a day and leave your hike for another time when the weather is more favorable. There’s never any need to take unnecessary risks. If you’re unfortunate enough to find yourself in a position where someone in your party is becoming hypothermic, the main thing is to try and move them to a warm environment as soon as possible, and to also try and rewarm them. This is of course not always possible e.g. if someone falls into a freezing river. In extreme situations or if you’re ever unsure what to do, call the emergency services to ask for advice and guidance. To close the freezing river example above off; if someone does fall into a freezing river in freezing conditions, in most cases the first thing to do is to remove their clothes to wring as much water out of them as possible. Then put them back on immediately. If you don’t do this, the water in the clothes can freeze to the skin which will cause a whole host of other problems. Tip: carry a Emergency Bivvy Bag to help keep someone protected in an emergency! They’re small, light and easy to stick into your day pack. Every emergency situation must be judged on it’s own special circumstances. Always call the emergency services for help if you’re unsure of what to do! Thankfully, I have never been in a situation where someone was hypothermic and I hope I never will be. I have read and heard some strange stories about what people do when hypothermia starts kicking in. Stories of people removing their dry clothes are not uncommon. This is due to some kind of mix of signals in the brain as they get colder and colder. Ironically, as hypothermia gets more severe, it’s possible that the person thinks they’re over heating so they start to strip off their clothes which of course only exacerbates the problem! Not good! I want to stress, that the purpose of this article is not to provide an exhaustive explanation of hypothermia or the varying issues it causes, far from it. Rather, the aim here is to give a good introduction to create awareness. Educate yourself as much as possible on this subject as you never know when you may need it! I recommend doing a certified wilderness first aid course if you can. The subject of hypothermia, along with many others will be covered in detail in it. Depending on where you live and hike, hypothermia can be more likely to be encountered so it is wise to educate yourself if that is the case. Keep you and your hiking friends safe while hiking this winter! If you found this useful, please like and share this post. I plan to start adding safe hiking tips to on an ongoing basis as part of the Hiking Guides and Resources and safety categories, and this is the first post in the arena of safety. When you go out hiking, nothing it more important than the safety of you and your hiking group, if you’re with others. Safety is of the utmost importance and you should always do everything you can to stay safe. Common sense and good decision making go a long way in keeping you good and enabling you to enjoy your hike with out any fear or concern of accident or danger. However, accidents can and, of course, do happen so it’s good to be prepared as best as possible and know what to do in an emergency. A key part of that is knowing how and when to contact help in an emergency. In this post I want to look at some high level guidelines of what you should do if you’re unfortunate enough to find yourself in an accident or emergency situation. This isn’t an article on wilderness first aid care, that’s a massive subject in and of itself that is best learned by training with an experienced trainer. This is however, a key part of the wilderness first aid process when you’re out on the mountains. In the first instance where any accident occurs you should try your best to assess the situation. The main thing to establish first is the extent of the injury to the injured party. If it’s minor and some basic first aid, I’m talking plasters and tape here, will treat it, and you know how to do it, administer the treatment and then take the quickest and safest route off the mountain if necessary. If the injury is of a more significant nature, you will need to make a more in-depth assessment as best as you can. Now, you generally need to have some first aid experience to do this effectively but overall, the main thing to ascertain is whether the injured party is in a fit enough condition to get off the mountain of their own accord or with help from the rest of the hiking party. For example, a common hiking injury is a sprained or broken foot or ankle. Hiking can involve a lot of walking over rocky or loose terrain which of course provides plenty of opportunity for ankle or foot accidents to happen. Even with the utmost care, you can just be unlucky and have a bad turn or fall. In this example, and to try and give an example of assessing an injury, try your best to understand if the ankle or foot injury is a sprain or a break. This should be relatively easy to establish. As a general rule, if it’s broken it is highly unlikely it can be walked on or can handle any standing pressure without very bad pain. A sprain on the other hand, while still sore, should be bearable to stand and walk on. If it’s a sprain, or break for that matter, the key thing would be to keep your socks and boots on and to keep moving! This may sound counter intuitive but continued movement ensures blood still flows around the sprained area and should provide enough mobility to get off the mountain to safety and treatment. Unfortunately once you get off the mountain and you eventually remove your boots, socks and rest the sprained foot or ankle, it will stiffen and the pain and lack of mobility will kick in. However, at that point you should be safely at home lying on your couch with your foot raised sipping a hot cup of coffee! This is listed here only as an example of assessing an injury situation and is of course specific to foot and ankle sprains and breaks. There is a wide range of factors to consider for the many possible problems and injuries a person could experience. However, the broad principle is the same for all injuries and you need to adapt this process as best as possible based on the nature of the injury e.g. if someone has banged their head, are they compos mentis, are they mumbling when they speak but think they are lucid, etc. Tip: If you ever get a chance to do a first aid course, take the opportunity to do it. Many companies offer basic first aid courses at work for free on the condition you spend some time on their ERT (Emergency Response Team). This is well worth doing and you will pick up skills that could save a life! The best option for hiking is a wilderness first aid course. If you are unsure how to assess the situation or unsure what the best course of action should be, you need to contact Mountain Rescue or the Emergency Services. Contacting a rescue service will likely differ depending on where you are located so it is always wise to check out the best way to contact the emergency services in advance if you’re in an area unfamiliar to you. Usually, you need to call your normal emergency services number and ask for some kind of specialized service, for example a Mountain Rescue service. (I mentioned in a previous post that your most important piece of safety equipment is a fully charged mobile or smart phone. The Emergency Services should then patch you through to appropriate service who can initiate a rescue in the mountains you are hiking in. If you’re out of coverage, you will need to try and get into an area with some kind of coverage to make your call so keep trying intermittently. Incident detail – time it happened, what happened, etc. The rescue service will use this information to help them make their own assessment of the situation. Based on that they will then give you advice on what you should do. If, using the example above, the injured party is incapacitated and has a broken foot or ankle, in all likelihood the Rescue service will ask you to give details of your location and tell you to make the person as comfortable as possible while they make their way to you to help. If you’re in anyway unsure about something, don’t be afraid to make the call. Even if it isn’t necessary for them to come out, they will happily give you good guidance and advice over the phone and it’s better to be sure and safe than to be sorry! It’s worth noting that many Rescue services around the world are staffed by a lot of volunteers working on their own time, so a big salute should be sent out to them! I hope you found this short post on what to do in an emergency in the mountains useful. If you take anything from it, let it be this. Before you head out on a hike in a certain area, educate yourself on who to contact and how, should you or a member of your hiking party should be unlucky enough to get into difficulty. It really could be a life saver. If you don’t know, just dial the emergency services and explain your situation to them, they should be able to help and figure out who you need to be talking with. If you get a chance, I really recommend that you do a wilderness first aid course. This will provide some good education on what you can do in specific situations and what you can do at the scene while you’re waiting for help to arrive. Have you ever been in an emergency situation and had to call out an emergency Rescue? I’d love to hear your story in the comments below. Today, continuing on in our series on getting started with hiking, I wanted to do a short post on planning a hiking route. At the start of this series we looked at where you should go for your first inaugural hikes and how far you should go. When you have those things worked out, you then want to start thinking a bit more about your actual route that will fit the criteria you’ve laid out. Now, as I mention throughout this series of getting started with hiking posts, it’s a good idea to keep your first hikes well within your comfort zone and to stay on very well marked paths and trails, so much so that you could probably get away with hiking on them and making your way back to base without a map. Overall, the main priority is to stay safe so you have the freedom to enjoy your hike and get familiar with being out on the trail. The best way to do that is to do some good route planning in advance. For this I’ve listed some pointers below to help guide you through the best way to do this. Stating the obvious here but, in short, no matter your level of hiking experience, you should always plan your route in advance! no longer be in existence! Also, be sure to keep in mind that some basic land features like forests, even an up to date map, can change. For example, they are often cut down for maintenance purposes. When you go looking for it on your map, it may not be there which could lead to confusion. Now this post is part of a series mainly targeted at beginners who broadly speaking, probably don’t have finely tuned navigation skills. However, it is very possible that you could have someone who is new to hiking but knows a lot about navigation. If you fall into that category and you do happen to have good navigation skills get a hold of a route planner and write out your route including coordinates, key points, distance between key points, timing (how long you estimate it will take you to get from one point to another), etc. When you get more familiar with route planning, you can use certain tools and guides to help you work out more detailed information about your hike. For example, you can calculate the length of time your hike should take. Many people use traditional tools like Naismith’s rule to help them in that process, which although not perfect, is popularly used to give an idea of how long in minutes you should factor in when you ascend by an increment of 10 meters. I won’t go into too much detail on navigation this post, I do plan to start a series on navigation at some point though which should give a bit more information on the basics of navigation. In short there are plenty of tools and methods you can use to help you plan your route as you get more experienced. At the start though, I recommend you …. If you’re new to hiking or if you’ve only been hiking a short while but do not have reasonable navigation skills, using a map and compass etc., then you should stay on established trails and marked treks. I really don’t recommend that you go venturing out into the wilderness and stray away from established paths as it is very easy to get lost if you do not have the navigation skills to guide yourself safely across open terrain. The weather is another key factor here as if fog or mist develops you could be in difficulty if you can’t establish your position on a map and don’t know how to take a bearing to guide yourself safely out. If you’re hiking in a new area for the first time, it is also advisable to ask some locals or people who have hiked there before for any information on your route. The internet is a wealth of information of course. Generally it is a good idea to have a few people hiking together. If one or two people get into difficulty, the odds are that someone is still able to raise the alarm and get help. It is also a really good idea to try and hook up with some experienced hikers when you’re just starting out, that way you shouldn’t risk getting lost as their experience will keep you on the right trails etc. a great way to do that is to join a hiking club or group. You’ll not only be safe as you get started but you’ll likely make some new friends too. A simple but often neglected safety tip is to simply tell people where you are going hiking and give them the route you plan to take. A useful idea for this can be to photocopy the section of map you plan to hike and mark out the your hiking route clearly on it. That way, if you don’t show up for dinner, they have a pretty good idea where to send the search and rescue party! Again, Apps like Viewranger make this really handy and easy to do. I plotted the route above using it. When you set out on your hike it is wise to have your map, with the hike route clearly marked out on it, fully open and with easy access to reference. Maps, as you know, can be big and unwieldy so you may need to bend them about a bit to get the relevant area clearly and fully visible. 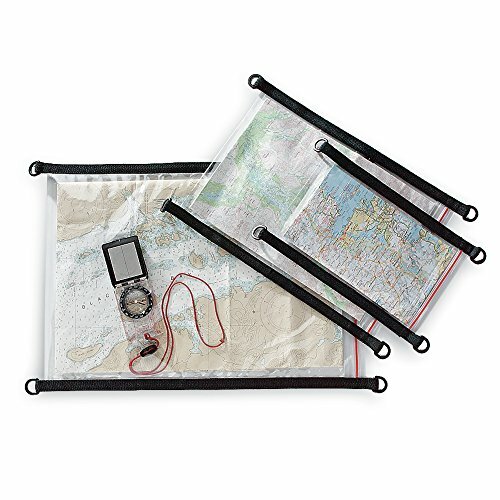 Another good tip here is to invest in a map bag, pictured above, to keep your map in. A map bag will keep your map dry and protected from the weather as you reference it while you hike. If you’re tight on funds a good food zip lock bag can do the trick just nicely! So there you have it. Whether you’re brand new to hiking or a very experienced hiker, these same tips always apply. There are many more things to consider but these are some fundamental tips, if you will, on how to plan your hiking route and of course stay as safe as possible in the process. When you’re at the stage of planning your route, you’re probably very close to hitting the trail and have all the other bits sorted out. Next up we’ll take a look at something everyone should be aware of when they’re out on the trail and that is to Leave No Trace. If you would like to start from the start of this series of posts on getting started with hiking, please click here. In this post I wanted to take a look today at some hiking food ideas that you can take with you on your hikes. I started to think about this last night while I was buying some of my usual hiking supplies in the store for the trail. Of course the more I thought about it the more options seemed to present themselves. So rather than starting with an exhaustive list of the many food possibilities for day or multi day hiking, I figured I would just start with what I know best i.e. what I take with me on my hikes. I am focusing on day hikes in this post and I will list out some of the general food ideas I regularly utilise. OK, so technically, not food but absolutely critical all the same. When you’re heading out on a hike water is of course of the utmost importance, it is critical to have a good supply with you so I feel I should put it in here at the start. There are various ways to carry water on the trail but if nothing else a basic water bottle from the store will do the trick. Always be sure you have an adequate supply with you, you don’t want to run out. You can get by for a long time without food with the only consequence being hungry and probably a bit grumpy 🙂 Not so with water as you can imagine. Remember water can be heavy to carry so if you’re going out on a longer hike, you could look to utilize water spots along way like rivers and so on. Always be careful when you drink water from a river or in the mountains. I have drank water straight from source in many of the places I regularly hike in but as general rule, you should always purify water found on the trail before drinking it. Moving on, I then look to things that are convenient and easy to carry. I also try to only consume healthy stuff as much as possible. I think fruit is great for a day hike. Easy to carry and great for a short snack aka as a ‘banana stop’. 5 minute break, some water and banana, happy days! Banana’s and apples are regular companions with me on my day hikes. Two of each is my usual stockpile. They are great and they can also be easily munched on the move. They also provide some water and a some sugar with fiber to top up on energy needs. You can of course pick your favorite fruits if bananas and apples aren’t your thing. Always remember that if you take fruits into the mountains, take your waste back out. Many people mistakenly throw the cores of apples and banana skins on the ground believing this is fine as they’re biodegradable. This just isn’t so and unless the fruit is native to that specific area i.e. it grows alongside the trail you’re on, you need to pack it out! There are lot’s of sound reasons for that which I won’t delve into here. Check out this post on leave no trace to learn more. For quick, convenient and healthy snacking I find nuts to be perfect. I usually have a nice mix of almonds, a few Brazil nuts, some cashews and walnuts. I am big fan of walnuts and they pack a healthy and filling energy punch for their size. Trail mix is another good option which can be easily purchased in any large grocery store. While trail mix will have nuts too it will usually also have dried fruit, grains and sometimes even chocolate. I prefer to keep it down to my own selection of nuts, almonds 🙂 , but trail mix is a fine and popular choice too. What I like to call the main event is your main meal while out on your day hike, generally speaking this is normally lunch. Up until about two months back I was a big fan of the good old fashioned sandwich or baguette! I of course tried to keep it as healthy as possible with some lean meat like boiled or grilled organic chicken, salad mix and mayonnaise on whole grain bread or in a baguette. The options for a sandwich are of course endless and you can adapt it to whatever your tastes are. However, about two months back I cut bread out of my diet completely as part of a new strength and conditioning program I started. Part of that was also to only eat, what are defined as, ‘clean’ carbs. While I had taken cold pasta and white rice meals with me on my hikes before, and again the options for pasta and rice are many e.g. a nice tuna pasta salad works very well on the trail, these aren’t classed as clean carbs. So I had a quick rethink and experimented with brown rice, a little finely chopped onion, chopped peppers, some boiled or grilled chicken, some herbs topped with some light seasoning. It was delicious and that, or a variation of it, has been my main staple on my recent hikes the last month or two. Again, I’m all for experimentation so mix whatever ingredients you like to see what you come up with. Overall, any of the options reviewed above are good for your main event. I did a post recently on taking a Thermos water bottle or flask for the trail. To me having a hot Thermos flask with hot tea or coffee in it is a wonderful luxury to have with me on my day hikes. This is even more important for me as we move further into the colder months. A hot drink is a great thing to have with you, not only functional as it’s hot and so warms you up, but also a great morale booster if you’re cold and standing in pelting rain! You can of course take whatever hot beverage that tickles your fancy e.g. any variety of tea, soup, etc. Next up, something I always have with me in my day pack is a chocolate bar. This is more for emergencies and so therefore I don’t always eat it while out on a day hike but it is wise to have one or two tucked away in the kit for an energy boost if required. I normally have a 70% cocoa dark chocolate bar but you can of course have your chocolate nibble of choice. Try keep it as a chocolate bar though, I don’t recommend carrying a box of chocolates on the trail! Personally, I think these are just bars of sugar. It confuses me when they’re marketed as being part of a healthy breakfast on a normal day. If you look at the nutritional label on the standard cereal bar, it’s usually loaded with sugar which I don’t think is a great idea for a normal breakfast. However, if you’re out hiking on the trail and burning lot’s of energy, cereal bars can really work a treat for giving you a quick boost on the move. So, for hiking I think they’re a winner! I usually have one or two packed away, alongside my chocolate bars, in my pack. Remember, some bars are much worse than others, in terms of sugar. Take a few minutes and read the nutritional labels on the packet boxes and try and find something that has a bit less on the sugar side with a reasonable amount of grains, seeds and / or nuts in them. Now, this is one I don’t normally use on the trail, especially for day hikes, but I wanted to mention it for any hiker who is thinking about longer hiking trips, more ultra hiking type of stuff. Some of the stuff that you normally are not supposed to be munching, like high fat potato or corn chips e.g. Doritos, can be useful on the trail for longer hikes. Why is that? Well the high calorie count can come in useful. If you are ultra hiking, you’re hiking very fast and probably moving at 3 to 5 miles an hour. Now, that is serious speed on the trail and it means you will burn a lot of energy fast. Some, not all I hasten to add, junk food can be a quick way to get a quick dose of calories. If you’re ultra hiking, you’re probably already skinny as a rake anyway so when you eat this stuff on a multi day trek, you just burn it right back off. The other advantage, it’s lightweight and relatively easy to pack away to carry. I hasten to add that I do not know that this scientifically sound but, from the once or twice I have used it, it seems to have worked. The higher fat carbs gave me an energy store of sorts. Again, for most hikers this one doesn’t apply but I thought I’d mention it. So that’s really it for this post. I think I will expand on this topic in future as there must be any amount of nice, as well as handy, food ideas you can take with you on a day hike. Just thinking about this now, while I have cooked and ate hot meals camping out many times while hiking, I have never ever brought hot food, aside from soup in a Thermos flask once or twice, with me on a day hike! There could be room there for experimentation, especially as we move into winter. Eating a hot meal on a peak would be a nice treat, definitely some food (excuse the pun) for thought! Finally, when you’re thinking of food ideas for your day hike, keep it convenient, healthy and tasty! Lunch is a welcome break on the trail and as well as being a necessary thing to keep your energy levels up, similar to hot tea for me, it’s a nice morale booster to get some tasty food into you while chatting with your fellow hikers over lunch on the trail! Do you have any tasty, healthy and convenient food ideas that you like to make and take on the trail with you? I’d love to hear about it in the comments below. I added another related post on the 10 best day hike foods which is also worth a look. Similar stuff to this but some more nutritional information is available there. Hiking Clothing Layers for the Colder Months! With the Fall in full swing and the winter months drawing ever closer, I thought it would be a good time to do a post on the simple but necessary process of hiking clothing layers. Layering will help ensure you stay warm, dry and comfortable on all your hikes. It isn’t by any means a complex thing but it is worth reviewing, especially for people who are new to hiking. While I am specifically thinking of the colder months here, the same process applies all year round. For example, it only gets colder as you hike further up mountains and you get more exposed to high winds, etc. In a nutshell, all of your clothes are layers. When hiking, you want to be sure that you have enough layers with you to ensure you can stay warm and dry. In the first instance there are base layers. These are the ones that are directly next to your skin. These need to be warm but they also need to have wicking ability to let moisture, like sweat, wick away from your skin. A handy example to use when thinking of base layers is to think of Long Johns but in two pieces so a bottom part for your legs and a top part for your torso. That is where the illustration stops though as Long Johns are made of cotton which is a big no-no when hiking. I should also add that I have never wore leggings on a hike, but in really cold temperatures, you may need them. Hiking Base Layers can be made from synthetic materials like polypropylene, polyester, etc. They can also be made from natural fiber like Merino wool, a very popular material that not only has excellent wicking capability but will keep you warm. Most of my base layers are made from Polypropylene but I do plan to venture into the wonderful world of Merino wool this Winter as I hear great things about it. Once you have some good base layers on, you then move up to the next layer. Here you’ll be thinking of a good hiking tee or shirt. Again, wicking capabilities are preferable. I tend to stick with polyester tees over my base layer top. It has worked well for me over the years so I am unlikely to change. Shirts can be good too though but I don’t really use them. For hiking pants, you need to again be thinking of breathability and wicking as well as some element of water repellency and general protection. Again, man made fibers like nylon are good as they can offer flexibility which is a plus on the trail. I know I’m stating this again, but pants made from cotton are out. In general, avoid cotton for hiking gear, it isn’t a good material for outdoor gear. Some features hiking pants should have is the ability to dry quickly and, if you can get them, ventilation zips on the sides at thigh level are excellent to have. When opened, they allow air to easily circulate around your legs as required. You can check out some decent hiking pants options here. The next layer up, you will want to have a warm hiking top of some kind to go over your base and second layers. I usually use a fleece jacket but a thermal jacket is also a really good option that works well for warmth. Finally, as you’re now up at the outer end of your layers you will need to have a waterproof hiking jacket and waterproof pants. These should ideally be breathable, water repellent, windproof, easy to put on and remove, as well as stow away in your pack. I use the Berghaus Helvellyn Pants and they’re excellent. There is a whole range of things to consider when buying waterproof gear so check out the waterproof hiking jacket buying guide and the hiking pants (external waterproofs) buying guide. It covers everything you need to consider for this outer layer set. Finally some clothing accessories are also crucial for hiking in the colder month’s. You will need a good pair of waterproof gloves that will keep your hands warm, dry and, ideally, also allow you good hand and finger movement. The last piece of the puzzle is of course a good hat. While a good hiking jacket or fleece may have good hoods attached to them, I personally like to have a good beanie cap too to keep the noggin that bit warmer. It’s worth pointing out that there are a whole range of hiking hats that are good to use at different times of the year, in different environments, etc. Check out the hiking hat buying guide to learn more on this subject. So there you have it, a quick synopsis of all the main layers of clothing you should have for hiking in the colder months! So what Exactly is the Importance of Having all these Layers Anyway? Well, the main reason for having all these layers is to enable you to stay warm and dry. The inner layers stay close to your body all the time and are designed to keep heat in and let moisture out. As you move further out, the next layers start to move to keeping heat in, with some breathability, to finally, at the external layers, letting moisture out but keeping the elements at bay too. The beauty of layering is that it is quite easy to adjust your layers to the needs of your environment as it changes. For example, if it starts to get colder as you ascend up a peak you can take out your fleece and slip it on over your hiking tee and below your rain jacket for some extra warmth. Or, if the rain starts pelting down you can quickly get your waterproof pants out of your pack to keep your legs dry. You get the general idea. Firstly, it is a good idea to take a spare set of clothes with you on all your hikes regardless, just in case you get wet or have some kind of incident that renders your clothes problematic. In particular, you need to be able to replace the lower layers that are closer to your skin as you need to get those off fast, if they get wet, in cold weather. Now, I should say that I don’t always pack a full set of clothes with me on a hike but I will always have a few extra layers and a full change of clothes in my car. It really depends on the hike I’m taking on as well as the conditions. Sometimes a full set of gear should be in your pack with you on the trail, you need to use good judgement. I review that further in this post. Secondly, aside from the extra set of dry clothes, I think it’s always a good idea to have a second long sleeved base layer as an extra safety net. The reason for this is just if it gets really cold very quickly or if you get injured and can’t walk, having another skin tight garment to put on will really help keep your core temperature good. Also, you never know if someone in your hiking crew might need a spare so it’s good to have an extra just in case! With the right gear both on and with you, you will have done all you can to ensure maximum comfort and enjoyment while hiking in the colder months. Always be sensible and check the weather before-hand and remember, if the weather is looking really bad just leave it for another day. The last thing you want is to get into difficulty and have to call for help just because you were too Gung-ho! If you’re totally new to hiking, I suggest you start here where I walk through all the key points you need to consider to get started hiking. There are plenty of links from there to, among many other relevant topics, posts about the different bits of gear you should have. If you want to get straight to business with it, check out the complete day hiking checklist which covers everything you need to consider in terms of gear and a bunch of other stuff. This post looks at some simple tips and tricks to help you clean hiking boots after your hikes. You can check out our top hiking boot recommendations for men here and our top hiking boot recommendations for women here. I was out hiking last weekend in some pretty wet and nasty weather and through some pretty boggy and marshy terrain. That kind of weather mixed with the dirt and debris on the ground can be tough on your hiking boots. This post is not intended to be a fully exhaustive treatise on how to best look after your hiking boots over the long term as there is much to consider for that depending on the type of boots you have, the material, etc. I will compile all that information into a more complete post in the future. For now I wanted to review some basic tips for cleaning your hiking boots that you can easily follow and implement immediately. The first crucial point is to clean your boots regularly and always after every hike where you get them very dirty. This is mainly to protect them from any erosive effects that may arise from the type of ground you were hiking in. For example, as I mentioned above, I was hiking in bog and marsh last weekend in mountains I know pretty well. I also know that the bog and marsh there is particularly acidic and therefore can eat away at your hiking boots over time if not cleaned properly. So, below are a few basic steps on how I go about cleaning and drying my boots just after a day hike. To clean my hiking boots properly, I first run them under my outside tap and use a tooth brush, any small brush will do, to brush off any dirt. I pay particular attention to the areas that connect one part of my hiking boots to another to ensure no acidic bits of marsh or nasty dirt are left to eat away at any glue or material. After I've completed step one above, I then take the boots indoors and remove the insoles. Removing your insoles won't be an option in many hiking boots. Don't worry about it if they're fixed inside you're boots, just skip onto the next step. If your hiking boots are wet, get some old newspaper and wrap it up into loose balls. Then stuff the paper inside your hiking boots loosely filling them from the toe to the top of the boot. I also like to make a few rips and tears in the newspaper (in my head I think this makes the paper more absorbent especially if it's lightly gloss coated paper). Leave the hiking boots and insoles overnight in a warm room to dry out. In the morning if your hiking boots are still wet, remove the first batch of newspaper, which will be damp and soggy, from your hiking boots and dump. Then repeat step three above until your boots are dry. When your hiking boots are dry, replace your insoles. and you should be good to go for your next hike! These are just some basic tips but simple care like this can really extend the life of your hiking boots. Even if you're hiking in dry weather and your boots only get a bit dirty on the outside, a light clean is still a good idea every couple of hikes. Do you have any tips for cleaning your hiking boots? We'd love to hear them in the comments below.